Our purpose of going to the state fair last night was to eat lots of crazy fair food. Oh and to people watch, which is a whole 'nother blog post that we are just not going to get into...mmm k.
Let's start out with this wonderful sign that we saw at the entrance that explains the "Top 5 Reasons Why Fair Food is Good for You." 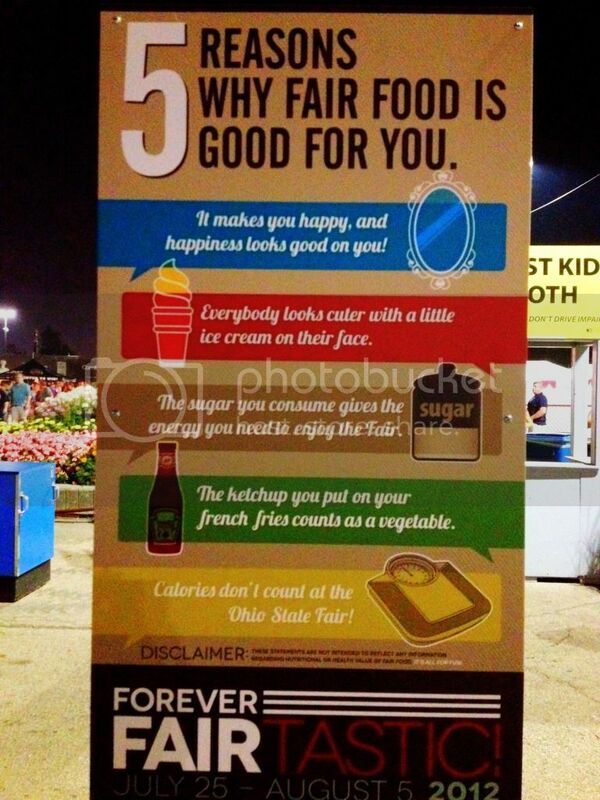 I really loved the last one that says "Calories don't count at the Ohio State Fair!" It really made me feel better about the 90 billion calories I ate last night. We started out with this baby. 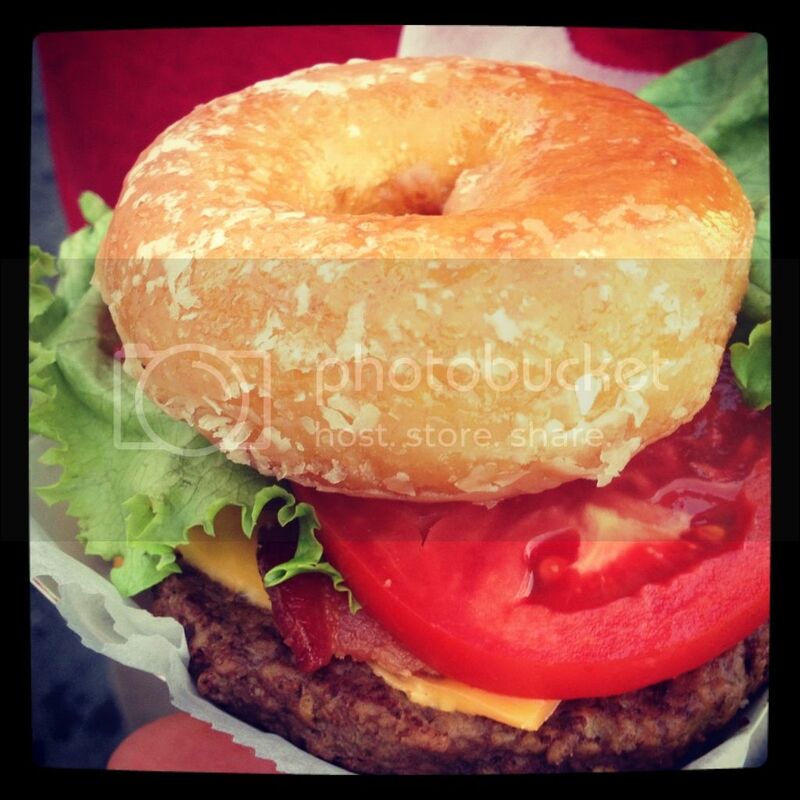 The Krispy Kreme Burger, which I had originally saw here (love me some Paula!). It is sooo bad for you, but OMG it was sooo good! I was expecting it to be really sweet, but the donut really complimented the savory burger and the saltiness of the bacon. It was really hard to eat because it was so thick. Oh and it was really sticky since the donuts were glazed. Overall I would totally eat this again. Ok, so I would eat like 1/3 of it again like I did this time. We totally shared everything we ate last night, which made us feel a little bit better about sharing all of these calories. We then moved on and had a pulled pork sandwhich with some potato salad just to feel like we were eating somewhat normal. We also tried the fried Buckeyes, fried Oreos and fried Nutter Butters (also known as combo #2). 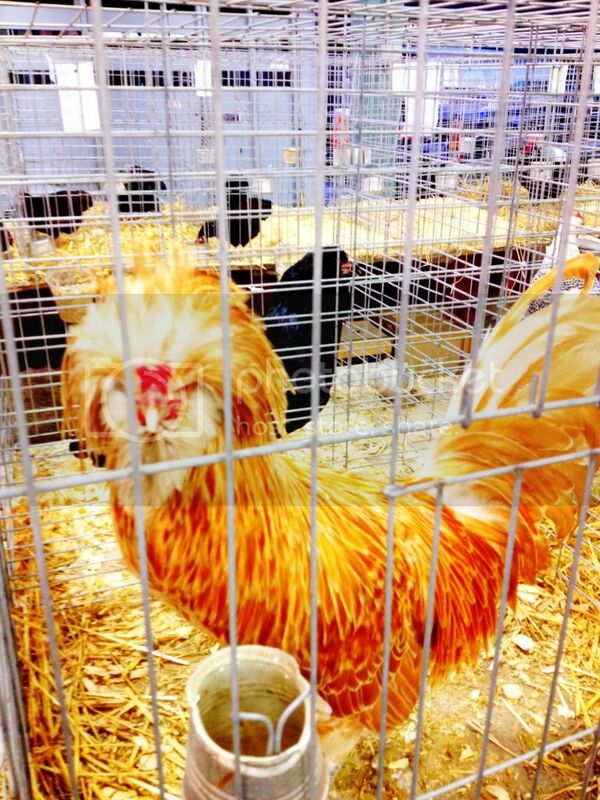 I think every state fair tries to fry up the craziest things each year. I saw a lot of these, as well as fried Twinkies, fried grilled cheese sandwhiches, fried candy bars (Snickers, Milky Way) and fried Poptarts. I totally wanted to try the fried Buckeyes since that is an Ohio tradition and the Oreos since I have always loved them! I loved the fried Buckeyes. They were really more like fried peanut butter and were soft and sweet. The fried Oreos were just ok. We ate these when we got home because it was getting late and we just wanted to get out of the fair, so maybe that is why. I did not try the Nutter Butters because the Oreos and Buckeyes were so sweet I didn't think I could handle the Nutter Butters, but my boyfriend said they were almost all peanut butter, so I would assume they are just as good at the Buckeyes. 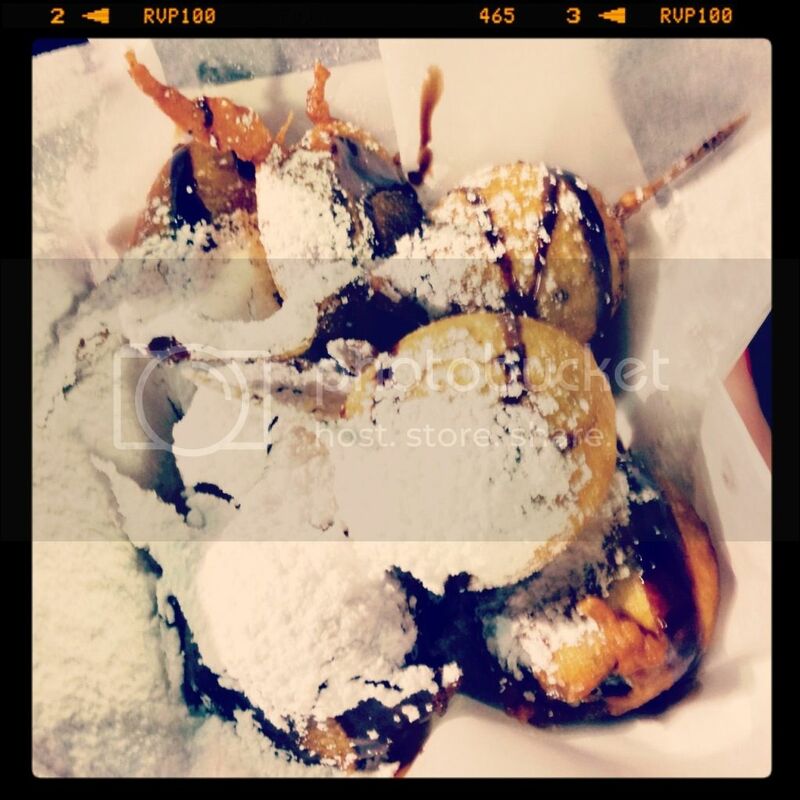 We of course had them add powdered sugar and chocolate syrup to them, because why wouldn't you. As they say, when in Rome. We also saw some fun fair animals. 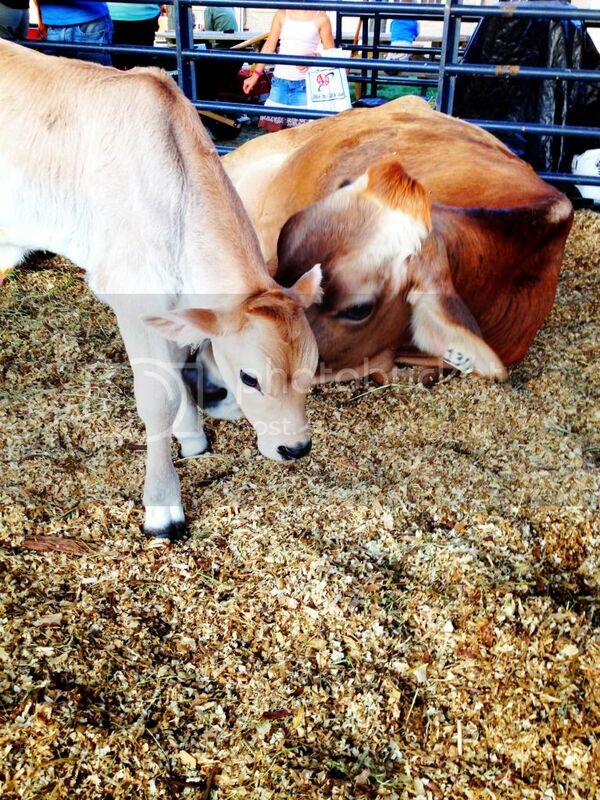 Some of the animals had just had babies, so of course we had to go check out the babies! 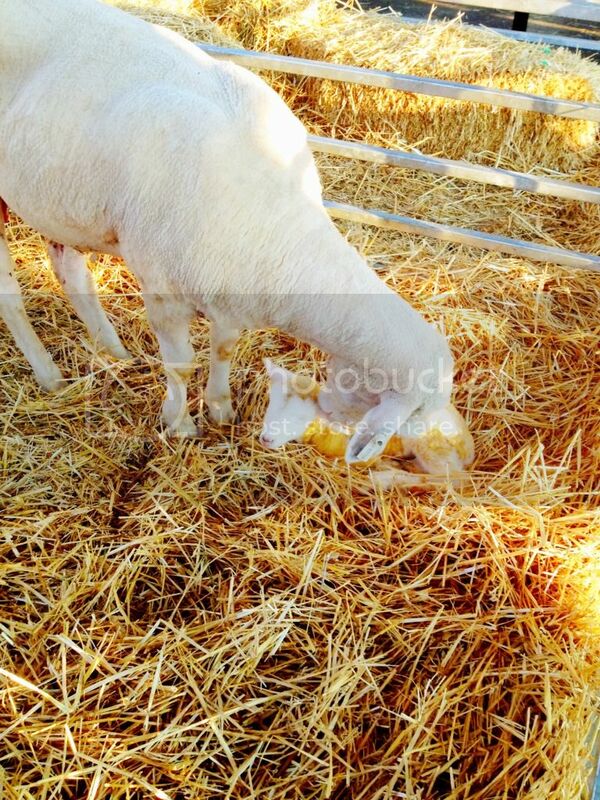 Here is a baby lamb, and it looked like it was just born. The momma was still cleaning it off, which was a little gross, but he was so cute!! And look at this little guy. He was so cute, and had the prettiest eyes. I just wanted to go up and give him a big hug, but I am sure the momma (who was also still cleaning him), would not approve...ha! 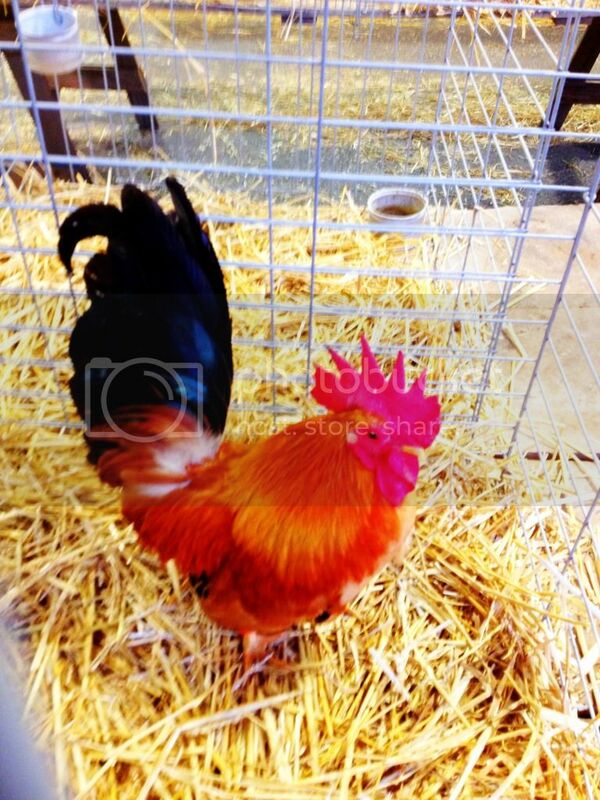 We had to see some chickens also. They were very loud and kept yelling at us as we walked by. Kind of rude wouldn't you say! This one was really pretty and his tail was kind of shimmery, which I really liked. 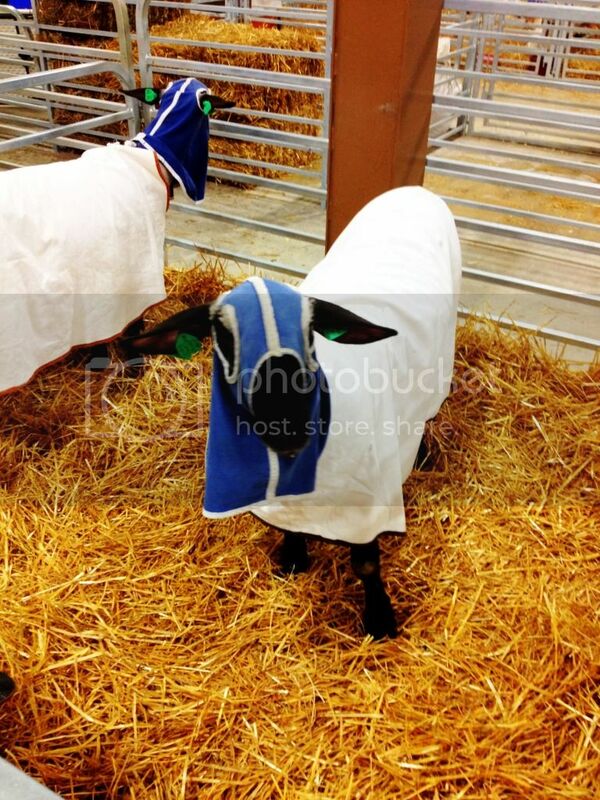 I wanted to see some cute sheep, but they were all covered up in their snuggies for the night. It was funny because they couldn't see very well in their night caps, and as we approached them we kind of scared them a little. They kept jumping everytime we walked by. We also saw some rabbits, turkeys, cows and horses. It was a full fair experience, minus the pigs. 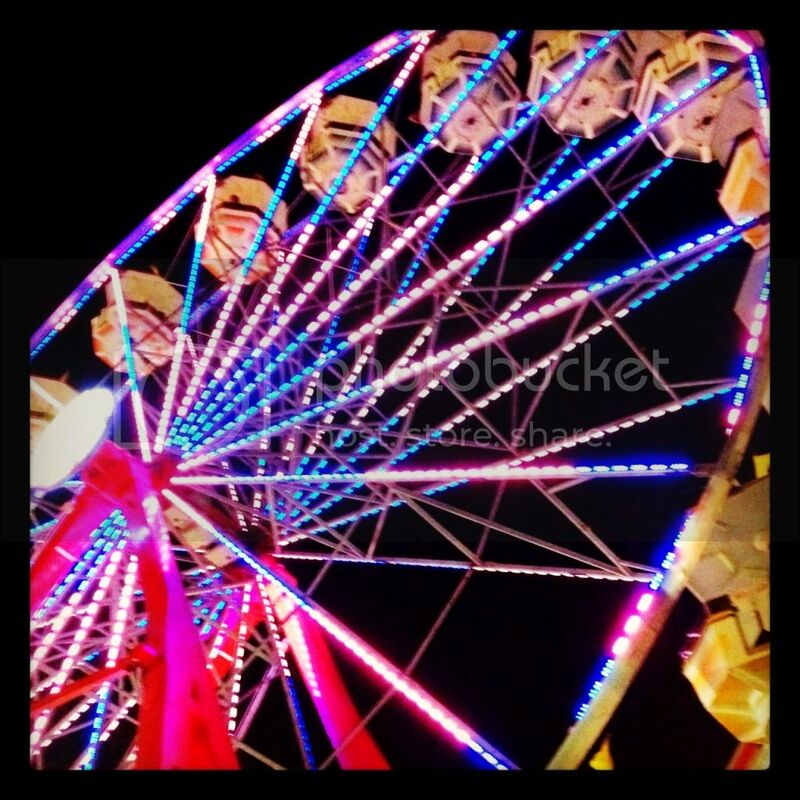 We ended our night walking around and snapping pictures of the rides all lit up at night. It was such a fun night! That burger sounds so interesting, and I'm sure it was delicious! I haven't been to a fair in ages.